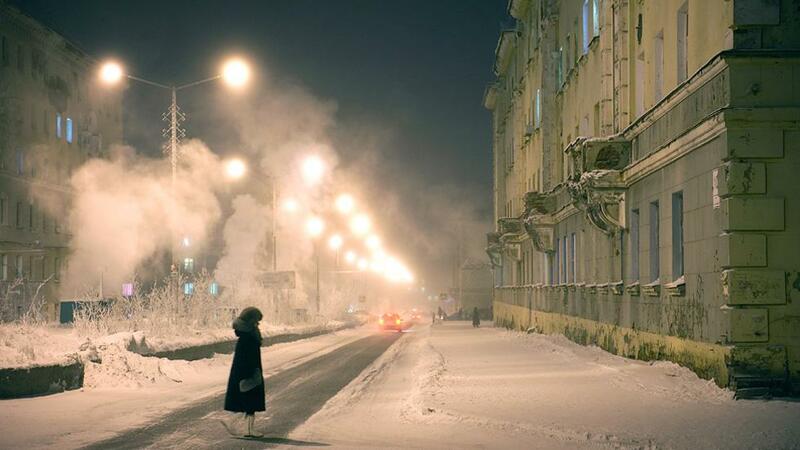 Winters are long and cold in Norilsk, Russia, with an average temperature of minus 31 degrees Celsius (minus 23 degrees F) in January. Days are characterized by frost, coupled with strong and violent winds. The cold period extends for about 280 days per year, with more than 130 days of snowstorms. What is life like in the world's northernmost city, which also happens to be one of the world's darkest, coldest and most polluted cities? Photographer Elena Chernyshova spent eight months in the Siberian city of Norilsk, one of the few cities located above the Arctic Circle, between 2012 and 2013 to document the lives of residents who have learned to adapt to one of the harshest climates in the world. Aside from living with ecological, climate and polar night challenges, inhabitants of Norilsk also live in relative isolation. The city is only accessible from Russia by air. Waterways connecting the city to the rest of the world can only be used during the summer months. And while temperatures can reach 25 degrees Celsius (77 degrees Fahrenheit) during the summer, a lack of green spaces and parks - Norilsk's surrounding areas are naturally tree-less tundra, only a few trees exist in the city - means inhabitant have to go to great lengths to enjoy nature. Click through the slideshow above to learn more about life in Norilsk. View more of Elena Chernyshova's work at her website.